The local food business is undoubtedly lucrative, especially with the Pinoy’s penchant for eating. But how do you set yourself apart from all the other restaurants that are popping up? How are you going to get a slice of the pie when everyone else is competing for customers? As with many things, hearing other people’s experiences and opening yourself up to people on the same wavelength can be a source of inspiration. 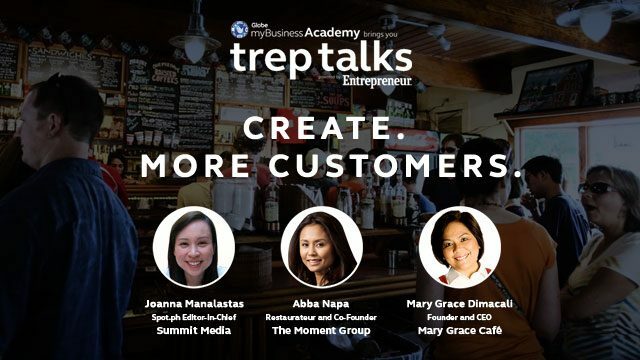 This April 5, Entrepreneur.com.ph in partnership with Globe MyBusiness Academy, is holding a Treptalk at Square One, BGC. With The Moment Group’s Abba Napa, Mary Grace Cafe’s own Mary Grace Dimacali, and Jo Manalastas of Spot.ph sharing their insights on the local food industry, learn the secrets to creating more customers and pushing your food venture towards success. Abba Napa, as one of the founders of The Moment Group, has a unique perspective on the local food and beverage industry. With the The Moment Group being responsible for bringing to the country Din Tai Fung, Abba Napa has customers lining up for xiao long baos. Aside from that, she and her co-founders are also responsible for a diverse range of restaurants, from custom blended burgers at 8 Cuts to prime spirits at Bank Bar. Mary Grace Dimacali has made a name for herself with the eponymous Mary Grace Cafe, home of everybody’s favorite ensaymada and cheese rolls. Her learnings from moving her business from her humble kitchen to more than 25 cafes all over the metro is valuable not only for small businesses looking to expand, but also for food entrepreneurs who are seeking to make their own businesses a household name. Spot.ph has been the go-to website for foodies in the metro, and its editor-in-chief Joanne Manalastas has particular insight on the Filipino dining habits. From highly shared food features to knowing what the Filipino customer likes in a restaurant, she has a hand on the pulse of the Pinoy foodie, whether they are craving for the latest food craze or hankering for the old favorites. The Filipino diner is a mystery, but some people have cracked the code. 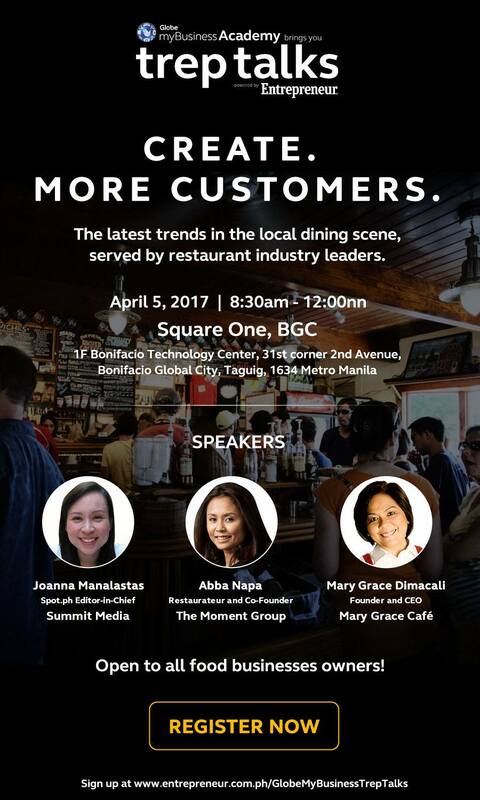 Join the Treptalks on April 5, 2017 at that Square One, BGC, 9 a.m. to 12nn and find out how you can bring more customers to your food business.